BOTTOM LINE: A dark drama about what motivates the efforts to treat and eradicate the Ebola virus in Africa. In an unnamed African city, two pharmaceutical scientists, two aid workers, an African landowner, and a 20-something freelance American journalist looking to make a name for himself are brought together by the hideous Ebola virus. Of course, they’re all here out of humanitarian concern and altruism. Or are they? This new drama by veteran journalist and first-time playwright Sarah Yuen and actor/filmmaker Jack Gilliat asks if altruism exists or if every humanitarian act and innovation is motivated by self-interest. At the center of the play is Aisha (played with elegance and beauty by Santoya Fields), a native African and trained scientist who works tirelessly to find a vaccine in an effort to save her village. She is the most earnest and selfless character in the play, and Fields succeeds in making us care deeply for her. We quickly learn to dismiss her lab partner, Aidan (Daniel Damiano), when he makes it clear that his efforts are only driven by money. And then there are the aid workers (Joan D. Saunders and Lucious Conway). Surely, one imagines, they have no motivation other than concern for human life. But when a young journalist (played by Gilliat) pries, they confess that they are administering a vaccine they know is doing harm to the population. They’re willing to do so, they admit, because keeping their jobs is the highest priority. The play’s message is quite dark. It challenges the assumption that people are basically good, and asks us to accept that most people act out of self-interest no matter the detriment to others. I’m not one to shy away from theatre that has a bleak outlook on life, but Echoes of Ebola doesn't offer enough detail to be believable. Directed by Zenon Kruszelnicki, some moments are quite powerful. One of my favorites features a tribal dance performed by Manny Dunn (who doubles as a silent bartender in a hotel bar). But nonetheless, without any information about who these characters are or where they’re from, the environment feels ungrounded and highly fictionalized. The play’s takeaway is a very serious allegation that the Ebola epidemic in Africa was spread deliberately by the First World as a depraved effort to control the population of poverty stricken countries. If you find yourself interested in conspiracy theories, then Echoes of Ebola might be right up your alley. But before I can allow my feathers to be ruffled by such incriminating accusations, I need more information than what was provided. 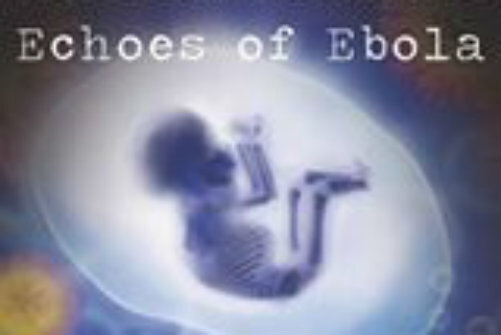 Echoes of Ebola is by Sarah Yuen and Jack Gilliat. Directed by Zenon Kruszelnicki. Set Design is by Eric Marchetta. Lighting Design is by Michael O'Connor. Music Composed by Dani Howard. Assistant Director is Teresa Lafferty. Stage Manager is Sen Enver. The cast is Santoya Fields, Daniel Damiano, Joan D. Saunders, Lucious Conway, Jack Gilliat, Yaw Assante and Manny Dunn.